Is there a better alternative to Ratiochinator? Is Ratiochinator really the best app in Mathematics category? Will Ratiochinator work good on macOS 10.13.4? 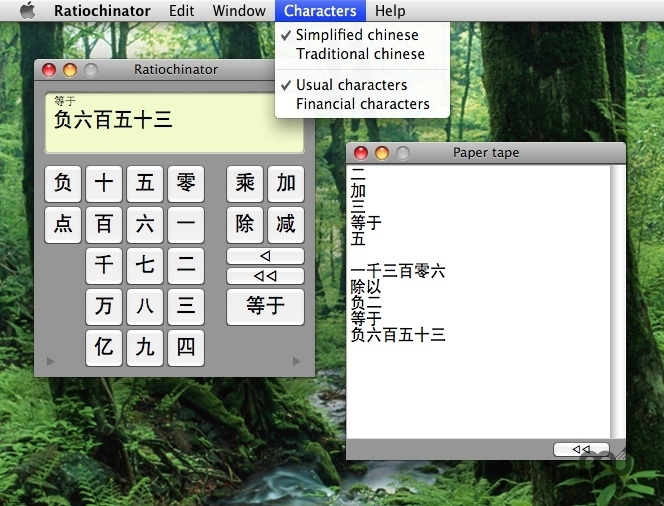 Ratiochinator is a simple pocket calculator... using only chinese characters (Writing rules are provided). Includes an instant converter (Both Arabic numerals/Chinese characters and Chinese characters/Arabic numerals). Usual notation or financial notation. Only one multilingual version (Universal Binary). Ratiochinator needs a review. Be the first to review this app and get the discussion started! Ratiochinator needs a rating. Be the first to rate this app and get the discussion started!